With each passing day it becomes more clear that Steve Bannon is now running the White House and Donald Trump is just sort of there. Bannon is now on the National Security Council, while Trump doesn’t even bother to show up to the Situation Room during military operations. But in a sign of just how thoroughly the former head of white supremacist propaganda site Breitbart is now taking over, he’s hired two of his fellow racist Breitbart writers for White House policy positions. The first is Breitbart immigration writer Julia Hahn, whose most recent articles on the site have bent over backward to dishonestly defend the lifelong racism of Trumps Attorney General nominee Jeff Sessions. The second is Breitbart national security writer Sebastian Gorka, who spends much of his time writing racist things about Muslims (you can google these headlines for yourself, but as per policy we won’t link to Breitbart). These two individuals will now help Steve Bannon direct White House policy. 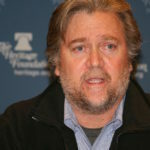 Additionally, Bannon is now seeking to bring in a third Breitbart figure in an even more bizarre manner, which suggests a shift in his approach in secretly running the White House. Bannon is now attempting to hire, says Politico, a public relations advisor just for himself. Naturally he has his eye on Alexandra Preate, who has previously done public relations for Breitbart. What’s notable in this potential hire is that Bannon now suddenly seems to care what the public thinks about him, to the point that he’s bringing in his own PR person; he’s probably the most hated man in America, and he’s widely viewed as a white supremacist.